Story by Andrew Koved, Queen Anne Greenways. The KeyArena redevelopment project has the opportunity to transform the Uptown neighborhood—for better or for worse. Seattle Neighborhood Greenways has been working hard to ensure that the Oakview Group, the developers hired for the project, will be building infrastructure and setting norms that will set the course for a world-class urban street system that can move people safely and efficiently to and from the arena, and connect to existing city-wide routes that will serve as key access corridors into and through Uptown, Belltown, South Lake Union, and beyond. The redevelopment of KeyArena has generated multiple studies, groups, and actions—with many questions focused on the impacts this project will have on surrounding neighborhoods. When Oakview Development Group agreed with the City of Seattle to redevelop the arena for use for hockey and basketball, they funded a study to look at the mobility and transportation needs of the area. This resulting North Downtown Mobility Action Plan (NDMAP), looked at the redevelopment of the arena at Seattle Center, the rest of the Uptown neighborhood, as well as Belltown and South Lake Union neighborhoods. Although not named explicitly in the process, Denny Triangle and parts of Lower Queen Anne were taken into consideration for the study as well due to their proximity. The goal of the study was to understand the current issues with pedestrian, bike, transit, freight, and public realm infrastructure in these areas, and then fund the implementation of priority projects from among the findings. Oakview Group will pay roughly $40 million over 20 years for these improvements; funding separate from mitigation costs which will be required through the environmental impact statement. North Downtown is seeing truly rapid growth, and it is critical that people on foot and on bicycles have safe and connected routes into and through the city. Seattle Department of Transportation has taken a piecemeal approach that has led to a small number of wins—such as the increased ridership on the 2nd Avenue bike lane—but many more continued gaps. Oakview Group was interested in studying these areas and helping to identify those projects that hold massive potential. Oakview Group sought a local, on-the-ground, perspective to best understand the transportation issues plaguing these neighborhoods, and so they brought together a large and varied collection of neighborhood groups and citywide organizations. Since December, Oakview Group has held monthly meetings to bring together this broad coalition to work on the NDMAP and receive their feedback. 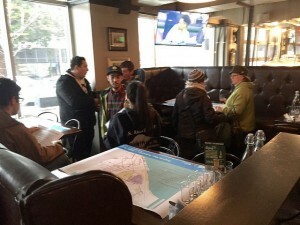 Queen Anne Greenways and Seattle Neighborhood Greenways were a part of these meetings, along with organizations such as Cascade Bicycle Club, Uptown Alliance, Seattle Center, Rise Up Belltown and Community Councils from Queen Anne and South Lake Union. The meetings combined the personal community knowledge with the expertise from Oakview Group, staff from City of Seattle including Seattle Department of Transportation and Council Member Sally Bagshaws’ office, and Nelson Nygaard, the firm conducting the NDMAP. The coalition faced challenges surrounding the diversity of interests represented at the table, with many groups not seeing the same concerns nor seeking the same solutions. With a long list of issues facing pedestrians and cyclists in the North Downton, Belltown, and South Lake Union areas of the city, Seattle Neighborhood Greenways staff, along with Andrew Koved of Queen Anne Greenways, brought together a smaller number of community leaders to prioritize projects that maximize the Oakview Group investment and help complete a basic bicycle and pedestrian network through North Downtown. 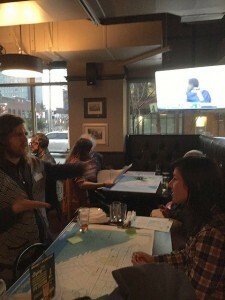 In collaboration with Cascade Bicycle Club, Seattle Neighborhood Greenways hosted an open house to get direct community feedback on the most important projects and goals for the NDMAP investment. Turn-out to the event was high despite the drizzly March evening, with nearly 100 community members from the various impacted neighborhoods. With snacks and drinks in hand, neighbors pored over maps and marked their priorities for pedestrian and bicycle projects that would facilitate mobility and increase safety. A wonderful range of experiences and organizations were heard, and the outcome of the evening reflected this diversity. It was important to make sure that the pedestrian and bicycle group led by Seattle Neighborhood Greenways understood the pain points of Seattle’s infrastructure, and this evening was key to ensuring that the projects selected by Oakview Group reflected the needs of the community. Though the needs and recommendations from the open house were many, they focused around people’s ability to safely connect into and through the North Downtown area along key connected corridors. The SNG-led group distilled these ideas into a set list of priority projects and improvements, focused on key pieces of the network that would have the greatest number of impacted users. Oakview Group released their draft environmental impact statement (DEIS) in May, and Seattle Neighborhood Greenways and Queen Anne Greenways participated in two opportunities to provide feedback and recommendations. The larger coalition of neighborhood groups participated in a second negotiating process and produced a strong letter endorsing a multimodal vision for the neighborhood and pushing the Oakview Group to work hard to decrease Arena attendees’ reliance on private vehicles. Then, SNG also produced a more direct letter in collaboration with Cascade and Feet First that was more detailed in asking for specific routes and improvements for people walking and riding bikes. Street improvements surrounding Seattle Center including protected bike lanes on Roy St, 5th Avenue, Broad Street, Queen Anne Avenue, and 1st Avenue North, and pedestrian improvements on Valley Street and Olympic Place. Wayfinding and other improvements on Harrison Street connecting Seattle Center to the John Coney Overpass for people walking and biking. Connections east from Seattle Center that prioritize pedestrian and bicycle movement including signal re-timing and upgrading along Mercer and Denny, and the construction of a Thomas Street Neighborhood Greenway. 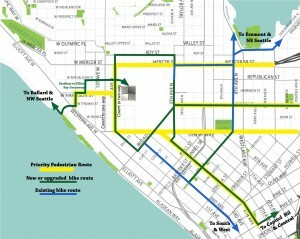 Connections to downtown routes including Bell Street and 4th Avenue. Other recommendations including expanding bicycle parking, incorporating lighting and wayfinding, and partnering with bikeshare and rideshare companies to provide designated parking and pickup locations. Exactly what projects will get funded is not yet known. Projects have a chance of being funded either by the limited NDMAP funding or the larger pot of mitigation funding from the Community Benefits Agreement that will result from the final environmental impact statement when it is released this summer. Then, all of these agreements must be approved by the Seattle City Council. Although the final outcomes cannot yet be known, it does look as though many of the suggestions from Seattle Neighborhood Greenways and from the larger neighborhood coalition will move forward. To show your public support for this project, mark your calendar for the next Seattle City Council Select Committee for Arenas meeting on July 26 at 2:00 pm. Inspired by this community-driven leadership? Pitch in to help make more organizing like this possible.